When God wanted a message sent to Belshazzar, he did not type on the king’s Facebook wall. Rather, “the fingers of a human hand appeared and wrote on the plaster of the wall of the king’s palace” (Dan. 5:5, ESV). It was a post to be remembered! And, surely the “writing tablet” Zechariah reached for to let people know his son’s “name is John” (Luke 1:63) did not have a keypad or lithium battery—contrary to how we now think of a “tablet.” Every book in the Bible began as a handwritten document. “I, Paul, write this greeting with my own hand” (1 Cor. 16:21). He was 24 years old, with courage in both pulpit and pasture. Since we do not often send or receive them anymore, perhaps it is useful to reflect on the significance of a letter handwritten. Handwritten letters get read. We throw away junk mail in a heartbeat. We delete spam messages in bulk. If email from a friend is lengthy, we might skim for the gist of it. But, if that same friend sent the same words on paper in his own hand, we would read it in its entirety. The content is identical, but the delivery very different. In a day when there is too much information on our screens to absorb, and we become adept skimmers surfing from site to site for a useful morsel, our attention span suffers. Reading someone’s handwriting forces you to slow down. The words are not perfectly formed in Times New Roman. Some may even take a minute to figure out. Personality shines through, without the need for emoticons. You realize every letter’s curve and every imperfection are there because, at a particular moment, someone’s hand was on that piece of paper. 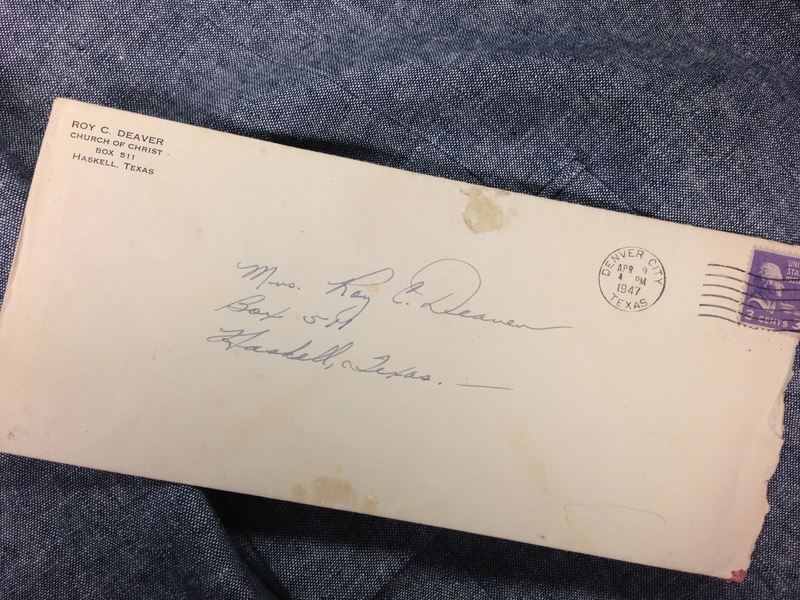 Handwritten letters get saved. Granted, not everyone who might send a letter is someone whose words you treasure, but a written note is more likely to be put away and read again than an email. A typed letter might get saved, depending on whom it is from, but it still lacks a quality in handwriting. Writing by hand tells the recipient he is worth taking time to address in your own unique script, even if it is more time consuming than typing. It takes longer to grow corn than to pop corn. An email is something to get out of your virtual inbox as soon as possible. Reply. Delete. But a letter in an envelope, that is something to slip in your jacket pocket for later reading in a quiet hour. Text messages do not get handed down to the next generation. Handwritten letters arrive with their own special aura. Grabbing a stack of mail out of the box, you immediately notice that lone envelope that is addressed by hand. Even from a stranger, you will read it because it was addressed to you by hand. As you unfold a page filled with carefully crafted words, it already has the appearance of eloquence—justified or not—simply because it is so unusual. Handwritten words weigh more than the paper on which they rest. They can weigh more than digital words. In a day when most written communication starts as a computer generated font, handwriting stands out from the ordinary. Handwriting forces you to use real English, and that is a good thing. Emails and texts are conducive to abbreviation and carelessness—a thinly veiled effort to strangle proper grammar. Write with ink and suddenly an “LOL” or “TTYL” seems out of place, undignified, unnecessary. Good English opens new vistas for self-expression that go unexplored now. You might even come to frown on the ubiquitous smiley face. Writing this kind of letter is a lost art, an art stolen by the nimble fingers of technology. So, if you want your words to stand out from what people are used to seeing all day every day, try long hand. You can convey a message in pixels on a screen. But, put ink to paper and you have something personal and tangible. Something that just might find its way to kinfolk years after you have gone, leaving in their hands the small trace of a life worth knowing.